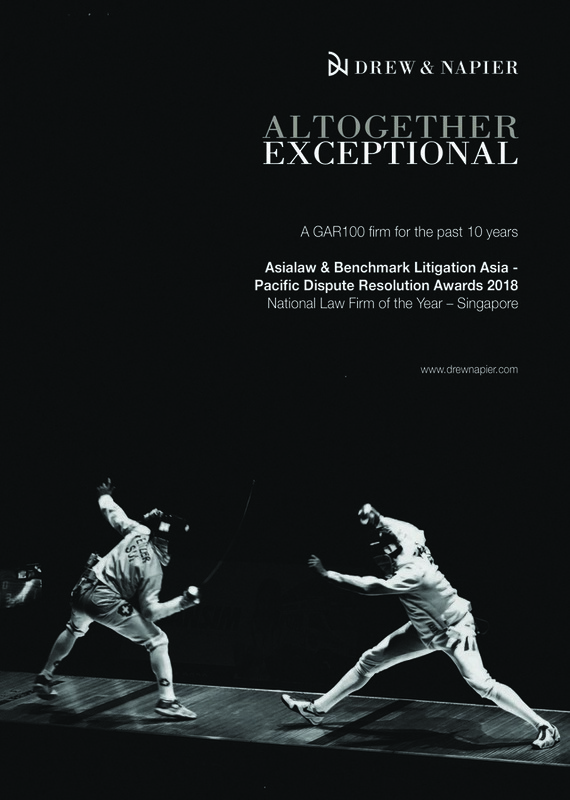 This Singapore firm, which can trace its origins back to the arrival of the first qualified lawyer in British Malaya in 1859, prides itself on being one of the largest players in the local arbitration market. Six senior counsel devote substantial time to the area – all of them home grown. The firm operates as an LLC with directors rather than partners. The department has grown in sync with Singapore’s emergence as a centre for international cases and several of the senior names sit as arbitrators. Cavinder Bull SC, one of the practice’s senior directors, is the best-known name internationally. Bull is vice president of the Asia Pacific Regional Arbitration Group and former deputy chairman of the Singapore International Arbitration Centre (SIAC). Other names to know include Davinder Singh SC, Executive Chairman of Drew & Napier and chair of SIAC since 2016, and Jimmy Yim SC. Asian multinationals and high-net worth individuals use Drew & Napier, to a large extent. The firm has advised an Indonesian conglomerate on a property development dispute and an Indian investment company in a telecoms case. Indian businessmen Malvinder and Shivinder Mohan Singh used it for a post-M&A dispute with Japanese drugmaker Daiichi Sankyo. Drew & Napier boasts a number of major Malaysian clients, including Berjaya Group, automotive manufacturer Sapura Industrial and oil and gas company Petra Energy. It has worked for a French pharmaceutical company, Heineken Asia Pacific Export, Norway’s Nexans, Rosneft subsidiary Tomskneft, CISCO, CRW Joint Operation, Longzhou Oil Service (S), Australian iron ore miner Roy Hill Holdings and the government of Laos. It has also been advising Lagardère Sports (formerly World Sport Group) in an ICC arbitration with a Sony subsidiary concerning media rights for Indian Premier League cricket. One of the firm’s most eye-catching results was helping to annul the bulk of a US$100 million SIAC award relating to the acquisition of steel assets in the Philippines. Drew & Napier wasn’t involved in the arbitration but assisted a consortium including the Philippine National Bank in their challenge to the award. The Singapore High Court set aside the entire award, with the Court of Appeal reinstating only a US$20 million portion of the award in 2015. The high-profile case saw the involvement of most of Singapore’s leading arbitration firms. In 2012, Bull and his team helped Singapore’s main power provider settle an US$80 million dispute with Australian listed company Downer over the construction of an underground electrical services tunnel. The Australian side reportedly paid US$40 million to settle the dispute. On the litigation side, it had a positive result for Indonesian client Bayan Resources in the first-ever case to be decided by the Singapore International Commercial Court, which ruled Bayan did not breach a joint venture agreement for the use of pollutant removal technology from low-grade coal. The firm represented Laos in one aspect of a sprawling dispute with the former owners of a casino near the Thai-Lao border. In June 2017, it helped the government prevail in a SIAC claim concerning the former owners’ multiple breaches of a settlement agreement. Laos not only won US$14 million in damages but defeated a US$394 million counterclaim. Remarkably, the firm also obtained a ruling that the other side’s counsel team – including a prominent US law firm – made misrepresentations to the tribunal. Drew & Napier is now helping Laos to enforce the award in the Singapore courts. It represented Japanese electronics corporation Sharp in a dispute with Chinese government owned manufacturer Hisense over an alleged breach of a licence agreement. Cavinder Bull SC is acting as lead counsel for an Indian power generations company concerning a dispute over the creation of a 2x300 MW coal-based power generation plant in India; the value of the parties’ claims exceeds US$600 million. Blossom Hing is working with Singaporean subsidiaries of a Chinese offshore oil and gas group to recover an estimated US$215 million outstanding from a Dubai oil and gas company, in a case which has been consolidated from 6 SIAC arbitrations. The firm will also assist in defending counterclaims of approximately US$200 million. Singh and Jaikanth Shankar are representing a gold mining company in a SIAC arbitration stemming from alleged breaches of a joint venture agreement entered into with a regional mining equipment and services provider for exploration. The claim amounts to around US$183 million. Sngeeta Rai joined as Director from WongPartnership in December 2017, while Jared Chen re-joined as Director from WongPartnership in August 2018. Internally, Daniel Cai and Chan Yong Wei were both promoted to Director in May 2018. A client who retained the firm for a technology implementation and operations dispute describes its performance as “extraordinary” given the highly technical nature of the matter. It says the team trawled through masses of documentation and dived deep into each issue.